You wish to determine who shall inherit your assets, in particular if there are no descendants: charitable institutions or e.g. godchildren? Spouses or cohabitants wish to ensure that the surviving partner is able to maintain the same standard of living previously enjoyed. Appropriate provisions can be made by preparing a suitable marital property and inheritance contract or drawing up a will in accordance with your needs. As a business owner or shareholder of a company you are contemplating the succession of your company. 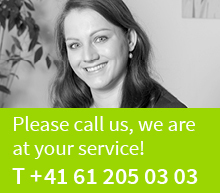 Our external tax specialists are happy to advise you about the best possible solutions.